After a solid day of cleaning and doing the last detail work (plumbing a sink, putting the electrical plate covers on, etc) the construction portion of the project has come to an end. It was just in time, too. 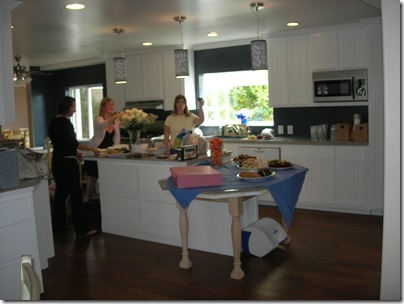 Toby had planned and was hosting a surprise birthday party for her sister Kelly. Toby wanted the first floor finished for the party. 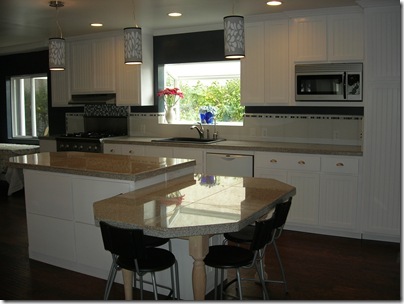 Here are some pictures of the finished kitchen. There is still some detail work to do. 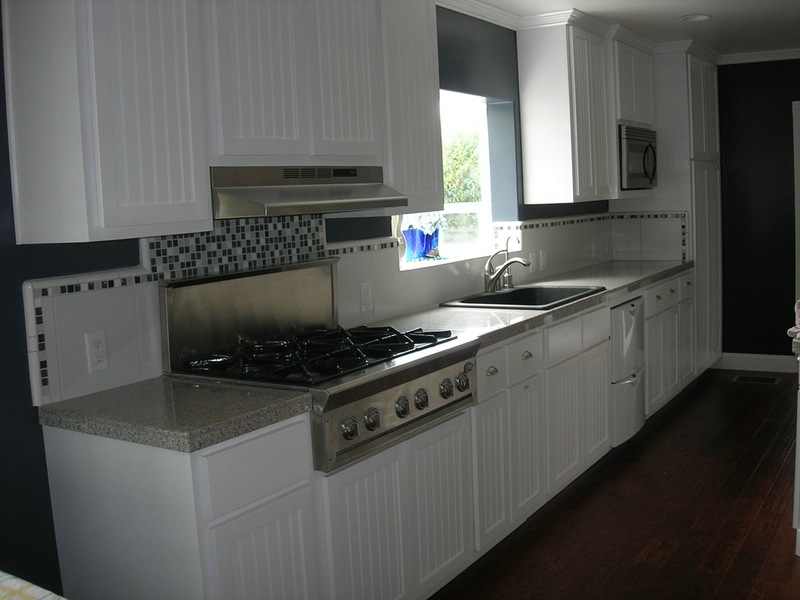 I am in desperate need of installing a water softener and the central vacuum system only has stub-outs and needs to be piped in. Also, the stairs need some carpet, but isn’t perpetual maintenance what owning a home is all about? The kids are at Poppa and YaYa’s house for Easter break, so Toby and I will take advantage of the time to move their room downstairs. 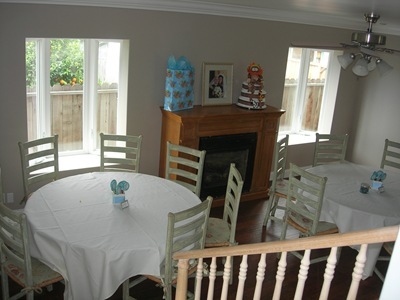 The last few weeks have been completely focused on getting the first floor finished enough to have a baby shower hosted here for Toby’s cousin, Chelsea. Chelsea’s mom (Toby’s aunt) Bonnie, stayed with us for the long weekend, and was a massive help. 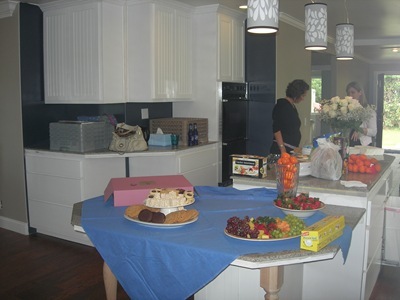 She cleaned on Friday, set up the tables and chairs Friday night and then on Saturday got all the food prepared. 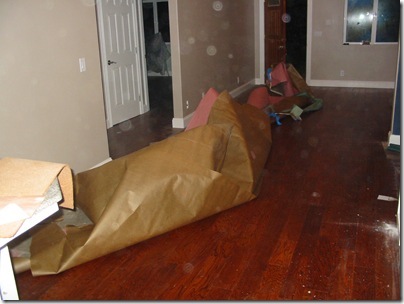 The pulling of the paper off the floor and the moving of the cardboard out of the house was done in such a rush that everything was just thrown into the front yard. It was trash city. The kids and I went out early on Saturday and began the yard cleanup. We got all the trash up, Max trimmed some of the bushes and Lucy swept up the front porch. My lawn hadn’t been mowed in months, so I did a ‘pre-mow’ with the weed-eater. I was racing against the clock, but finished cleaning up with about 15 minutes to spare. As a reward for doing a great job working so hard, I took the kids to see The Tooth Fairy. It was silly and perfect for Max and Lucy. 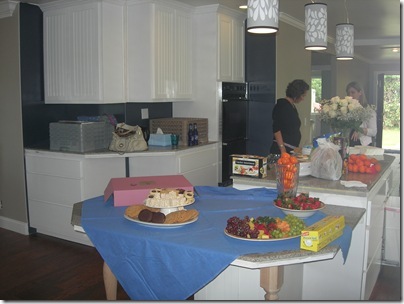 Below are some pictures that show the insides as the party was being set up. I think more than 30 people ended up attending. On Thursday night, all the tools were moved out of the house (or hidden in the drawers of the kitchen). 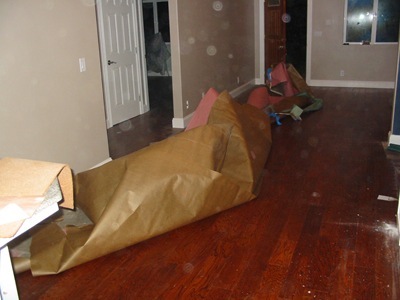 After the floors were tool free, the paper came up off the floors. That left a lot of dust everywhere. We swept / vacuumed, dust mopped and then wet mopped to get the floors shiny clean. Poppa stayed an extra day, working on putting epoxy in the joints of the tiles on Tuesday. When I got home from work, all the joints had been filled. I love those kind of work days! 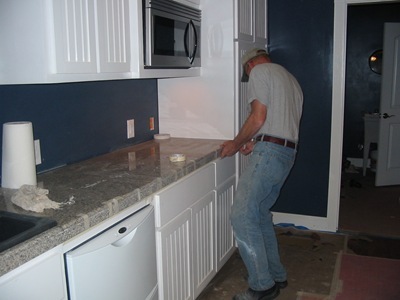 We worked together to get the edges placed on the long strip of countertop. 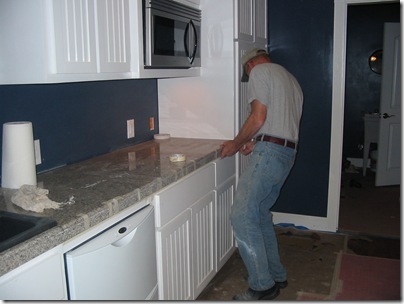 We used Bondo to attach the 1 3/8" wide strips of granite tile to the edge of the counters. 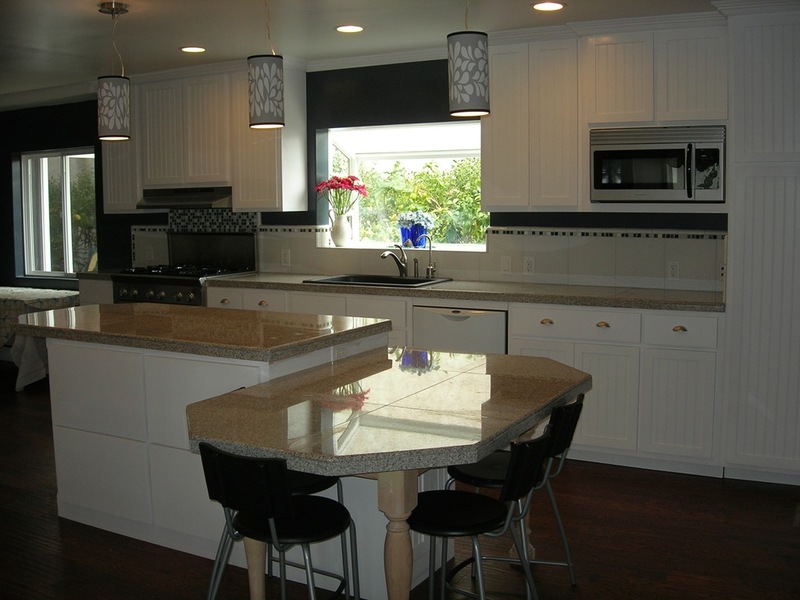 Then we mixed 2 different 2-part epoxies to make the ‘grout’ the color that Toby wanted. In the picture below, you can see that we used masking tape to hold the edge pieces in place while the Bondo cured. The cure only took about 5 minutes and then the tape could come off. After spending most of Saturday working on refrigerator / water issues, Pop had to go do some long planned Valentine’s day stuff with YaYa. 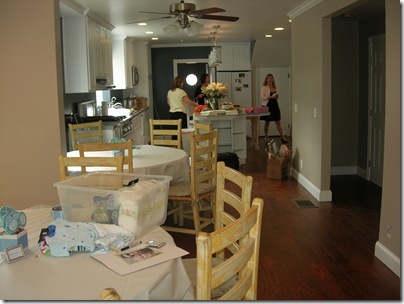 He came back Sunday afternoon to continue to get things ready for Chelsea Nawai’s baby show next Saturday. 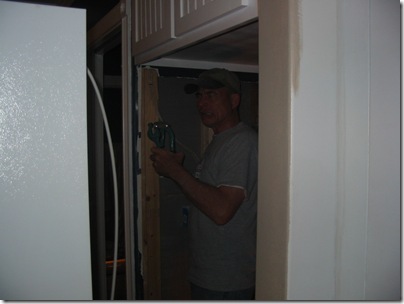 The task for Sunday was to get the refrigerator into its built-in alcove. 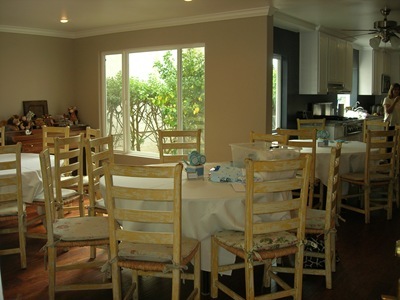 The big question since the drywallers finished up last September is : Will the reefer fit into the alcove? Even before the drywall went up, the area for the reefer had shrunk. It was measured out at plenty of room for the reefer, and to be on the safe side we had 1/2" drywall (instead of the 5/8" used everywhere else) installed. But at the end of the day, what should have been 3/4" to spare in the alcove was measuring out at exactly the same width as the reefer. Not good. But we were hoping and keeping a positive attitude. Thinking good thoughts got us nowhere. The reefer would not fit into the alcove. Not even a little bit. The drywall had to come off. I thought we were done with demolition, but the hammers were swinging like crazy. 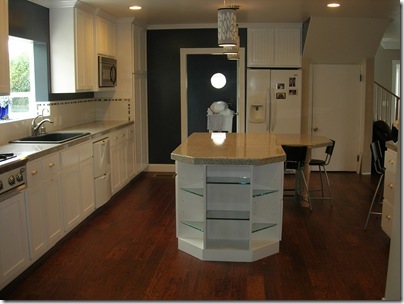 Once the drywall was removed, it was obvious where our extra space went. The bullnosing on the corner bead was not accounted for in our measurements. 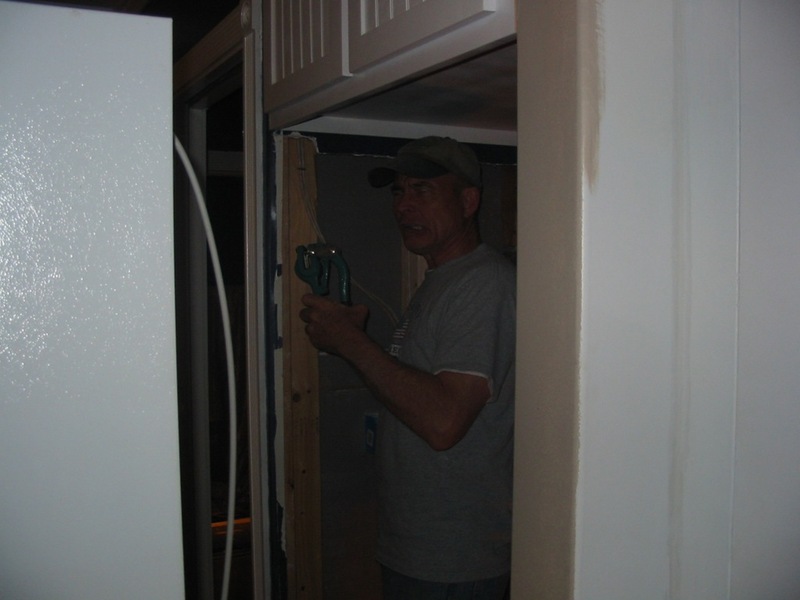 The picture below is a bit dark, but if you look closely, you can see the frustration on Pop’s face while we pulled out the drywall.